Character we've reviewed before? Check. Sculpt we've reviewed before? Check. Quick blog review? Check! Plus, that's how we started this Spider-Man series of Marvel Legends, so it only makes sense that that's how we bring it to a close. With ninja-like stealth, Miguel O'Shea fights against a dark future in the year 2099! Hey, remember all those times Hasbro called the Green Goblin "Norman Osborne"? 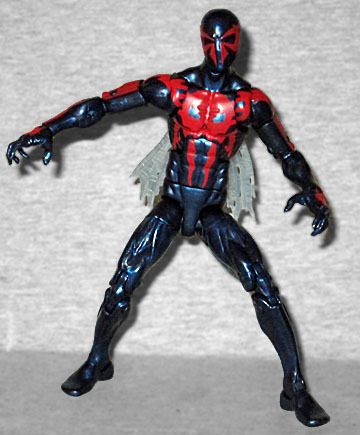 Well that's nothing compared to this figure, because Spider-Man 2099's real name is Miguel O'Hara, not Miguel O'Shea. This isn't even the first time Hasbro's made the same mistake, because one of those Titan Hero figures said the same thing. 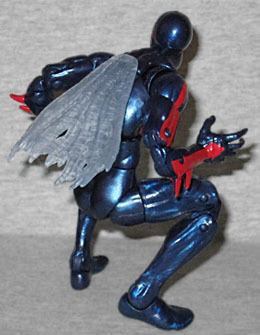 They got it right the first time they made a Spider-Man 2099 figure, so what happened between then and now? Did they misplace their Official Handbook of the Marvel Universe? This is basically just the new Spider-Man body with Black Panther's hands. He does get new forearms, with spikes sticking off the back, but what's really impressive is the head. All those sharp red patterns? They're all sculpted on! Nice! Unfortunately, that makes the ones on the rest of his body, which are just paint, feel slightly disappointing. So it goes. They did give him his Lyte Byte cape, which is made from the same stuff as future hang-gliders, and allows him to drift on air currents. It's a new, molded piece, not cloth like the last attempt, and it plugs into his back-hole. It's intricately sculpted, to look both tattered and like webs, and is done in clear plastic. The articulation is of course the same as on the Spider-Man figure, so-so hips and all. It's still good enough to allow him to emulate the fixed pose of Hasbro's first Miguel O'Hara, but also do other things as well. And that's why an articulated figure is always better than an unarticulated one. Spidey's Build-A-Figure piece is the scrawny right arm of the Hobgoblin, as well as his newest weapon, a big flaming sword. But we'll talk more about that when we get to the BAF review. Marvel Legends Spider-Man 2099 is so superior to the Spider-Man Origins figure that they might as well not even be from the same company. Which, technically, I guess they aren't, since the old one was a repaint of a ToyBiz mold. But it was more like a McFarlane product, with its stupid pose and general lack of useful joints. This one fixes all that, though. This entry was posted in blog exclusive review, Hasbro, Marvel and tagged Marvel Legends, Spider-Man. Bookmark the permalink.